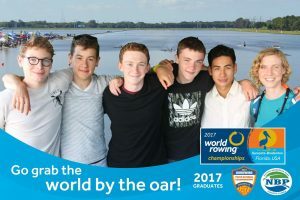 This spring 130 Lightweight Boys 4+s, hailing from all 50 states, fought for a bid to compete at USRowing’s Youth National Championships in Sarasota, Florida. Only 20 crews across the nation earned their way to the National Championship and Cambridge Rindge and Latin School attended as the fastest Boys Lightweight 4+ representing the Northeast Region. On Friday morning, June 9th, the CRLS 4+ came in 8th place in the time trial, qualifying them for the A/B semi-finals later in the afternoon. The weather conditions were miserably hot and humid, a stark contrast from the 48 degree and rainy weather the boys had left behind in Cambridge. With minimal rest between races, the CRLS boys ventured back onto the course for the A/B semi-final. There they faced who would be the ultimate winners of the boat division, Rye High School. After pulling themselves out of last place in the second half of the race, the CRLS boys finished 5th, narrowly missing 4th place, and qualifying themselves for Sunday’s B Final. Saturday, June 10th, was a much needed day of rest so the boys could prepare their bodies for the biggest race of their rowing careers thus far, and in the case of stroke seat and senior, Chris Johnson-Harwitz, his final race. Major thunderstorms delayed a majority of the races on Saturday so the regatta officials were forced to alter the race schedule for Sunday. This change actually put the boys in a better position because their race was now scheduled for Sunday morning, which, as lightweights, is beneficial because the boys would not have to wait until the afternoon to weigh-in and then subsequently eat and hydrate. On Sunday, June 11th, as the crews lined up at the start line for their final race, nerves were high. As the starting light flashed green the crews shot out of the stake boats with lightning speed. It was the fastest start the CRLS boys had executed all week and it helped put them into a leading position with the top crews for the first 500m of the race. Soon after, Pacific began to assert their dominance over the field and the fight for second place was on. CRLS was solidly in third and making impressive moves over the other crews at 750m into the race and at the 750m to go mark. Greenwich, the other crew representing New England in the B Final, started making a move in the last 500m that CRLS powerfully fought against in the last 250m sprint. Both New England crews started to walk down the crew in 2nd place, Gonzaga College Prep, stroke by stroke, nearly pulling the crew out of its second place position. As the crews crossed the finish line it was a photo finish between Gonzaga and Greenwich placing 2nd and 3rd respectively, with times of 6:45.717 and 6:45.865. CRLS finished a close 4th place with a time of 6:46.849, 1.132 seconds behind 2nd, and less than 5 seconds behind the winning crew, Pacific, who finished with a time of 6:42.061. CRLS’s 4th place finish in the B Final declared them the 10th fastest Boys Lightweight 4+ in the country. The boys couldn’t be happier and we couldn’t be prouder.